The US Electricar Store is now open!! If you have not noticed or heard, I’ve opened the US Electricar.net store for USE owners so they can get repairs and parts to keep their vehicles running. There are links on this blog to take you there. Enjoy! First Dolphin charger transformers rewound! Today I finally got a fixture together to wind the T1 transformers that fail on the Dolphin chargers. 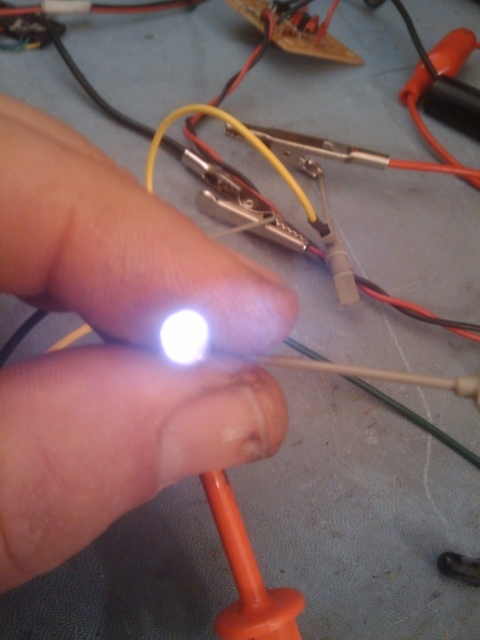 I used an IR led pair tied to a counter to tell me how many windings were made. I wrote several types of G-code to have the cnc mill help in the winding of these parts. It worked out well in the end after several iterations. I settled in the 532-540 ohm range after they were wound. This was a few turns under 3k. I have one more transformer to wind. I’ll take some better video with a better source. It took days to figure all of this out and get it built and tested. The original estimate for rewinding was 15 hours. By working on the G-code and the cnc hardware I knocked is down to just over 2 hours. But last night I had a better idea. Now the full rewind takes 5 minutes while the hardware counts every turn. Sweet! 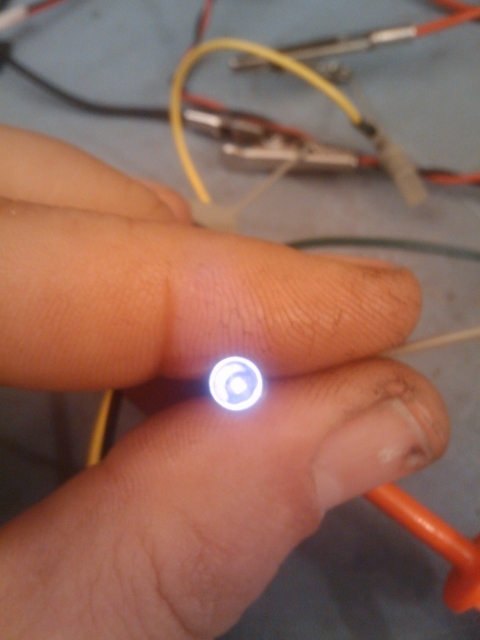 The brightness of this IR led was too high. The Rx led did not like so much light. These pics were taken with my G1 cell phone since the human eye cannot see Infra-red light. Thanks to Bob at Halted for that great tip! Video camera with night shooting have the same capability of seeing IR. This brightness worked well. I might even be able to drop it a bit more, but for now it worked fine. Here is a winding video from my G1 cell phone. You need Quicktime to play it. 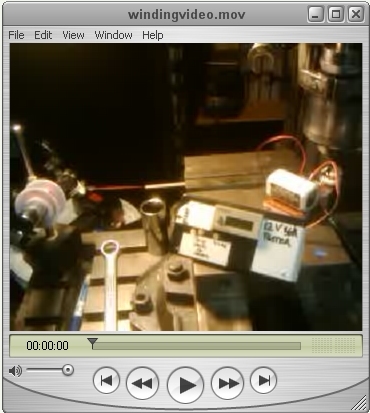 I didn’t sit still long enough to show that the transformer is moving up and down via the cnc. It spaces the windings out very nicely. I borrowed the counter from my automated battery load tester.